When I first began running around, camera in hand, with the idea of taking something other than snapshots in mind, composing in the glass was an achievable goal. I was using a 35mm Nikon FM SLR with a Tokina 35-105 zoom lens and a 24mm fixed length Nikkor. In fact, I began to feel as though it were some kind of moral failure to have to recompose the scene by cropping the negative, perhaps dishonoring my own skill and visualization. Leaving 35mm cameras behind led me to medium and large format tools truly capable of creating worthy enlargements. For me, working with natural light and wild subjects requires having systems light and compact enough to be able to move around with relative ease. And in the field, working with nature, you take what nature gives you. Those challenges only magnify when working with heavy and limited equipment. In my search for suitable medium format cameras (i.e., 120), it became clear that rangefinders of the 6X7 cm variety would provide me with the right combination of the largest practical negative and the suppleness I required in the backcountry. However, the problem of indirect focusing mechanisms and parallax correction means that I can never accurately ascertain the accuracy of my hard fought compositions. At some focal lengths, rangefinding can underestimate the actual image projection on film by as much as 20%. Composing in the glass? Out the window! Just for fun, add in the necessary restrictions of carrying a limited number of fixed length lenses and physical barriers to acquiring exacting landscape compositions. Once in the darkroom, the prospect of cropping the resulting negative became much more than an academic question. It was often a necessary condition, if not an artistic choice. 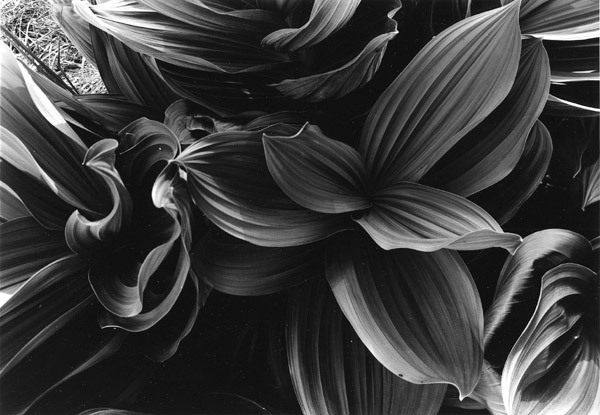 Likewise, the choice of a suitable large format system must be a compromise between producing an enlargement-worthy negative and the lightness required to obtain it. The 5X7 view cameras are the largest and heaviest I am able to manage in any shooting situation I am likely to encounter. Truth be told, I have rarely been able to make a full frame 5X7 inch negative work for me in a fine art print. I just don't see the world in 5X7 rectangles, and matting/framing prints for show is held more consistent by keeping to a standard 4:5 format. Rather, I pretty much always crop to a 4:5 aspect ratio (with little wastage), and in the bargain arrive at a negative still significantly larger than possible with 4X5 cameras. 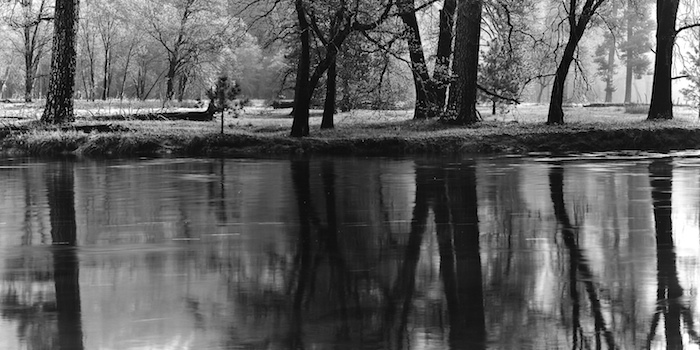 But something else unexpectedly wonderful has happened with use of the 5X7. I have ultimately ceased having any lingering doubts of composing only in the glass and restricting my vision to only one rigid perspective, although certainly possible with any view camera and suitable lens. 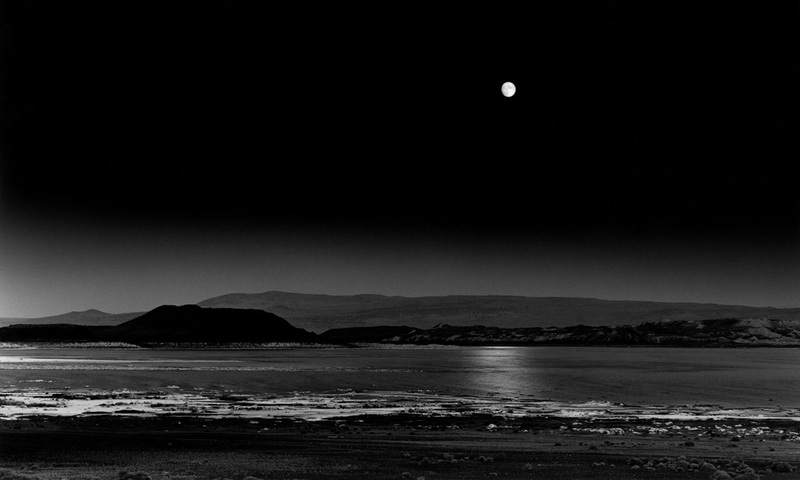 I planned and worked several months to execute my personal visualization of a scene I had experienced many times previously sans camera, as a waxing moon rose above the distant hills of Mono Lake. This proof languished in my files for the better part of four years, as I revisited it from time to time, never thinking it would amount to much. It was pretty clear that something about the geometry (even a 4:5 crop) wasn't working for me. One day, while playing around with my framing cards, I discovered an interesting crop of this proof which seemed to reduce unnecessary sky and foreground, and at the same time allowed the moon to find its way into a more aesthetically pleasing position in the sky. For the first time I saw (and I believed!) in the fine art potential of this image. Less than an inch-and-a-half of the total negative need be sacrificed in order to produce an image ultimately fine-tuned to a 3:5 crop. I dubbed it "widescreen", as it closely favors the commonly available 9:16 television formats in use today. Quite a magnificent effort, if I do say so. Although, I often feel the 24"X40" version of this print would be more at home across a bar in Lee Vining, Bridgeport, or Bodie! While certainly not a fine art print, the proof of Wildcat Falls #1 isn't half bad as is. With a little dodging and burning it would make a pretty good fine print. But, I thought this effort still quite unremarkable. 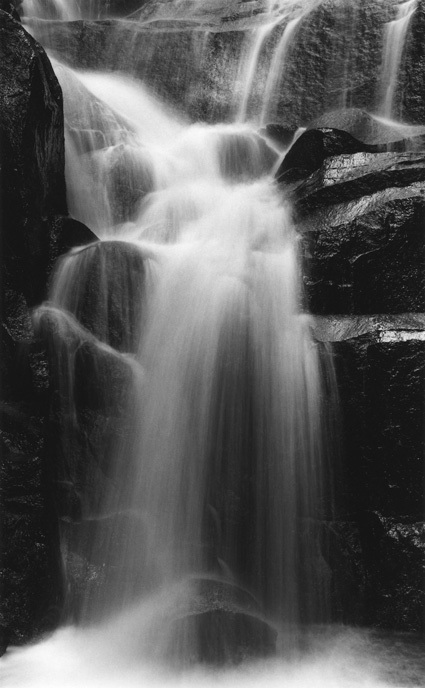 It seemed to lack complexity of tone and form, and failed to convey a dynamic sense of water falling over vertical granite. Looking at it anew, with narrower cropping in mind, seems to alter the lax dynamic of the proof to what naturally, is quite a dynamic subject. Voila! - a print which finally acquiesces to my visualization. I call these portrait oriented 3:5 aspect ratio prints, "tallscreen", in order to separate them from their 4:5 aspect ratio standard portrait style counterparts. 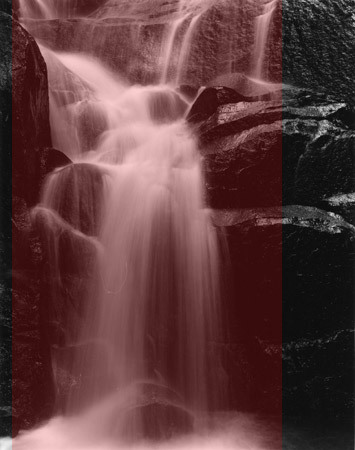 In truth this frame was selected for an edition mostly because it was the best representative of my Wildcat Falls Triptych. Just when I became convinced that I would never need another format choice I happened across compelling subjects in the wild and long since forgotten proofs that didn't conform to any of my preferred format choices. I was already cropping on the camera's ground glass. Why shy away from subjects not favoring predetermined rigid formats at all? In other words, just go ahead and shoot with the idea of cropping under the enlarger. 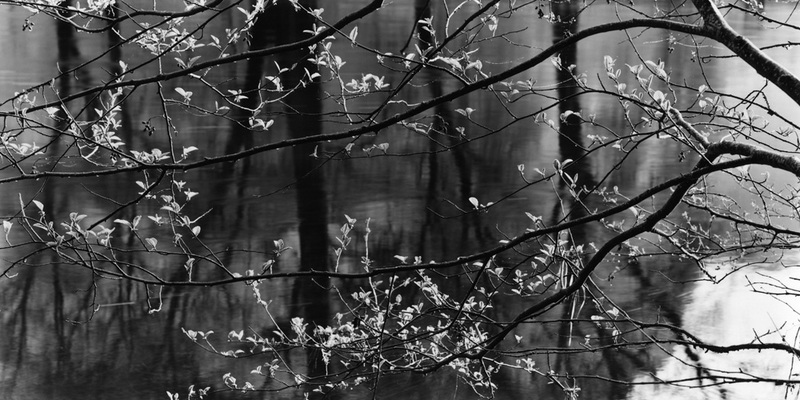 At the time, it was a satisfying experience to fall into ground glass under the darkcloth into this placid early morning scene of budding dogwood along the Merced River. 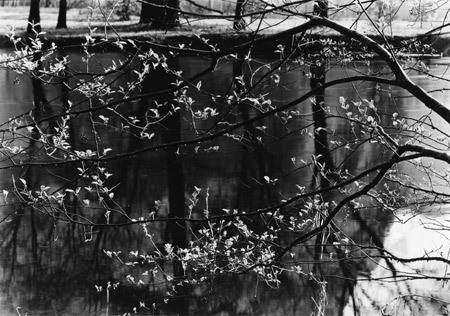 But this child has a sister print, Reflection and Flow #1, which is already of the 1:2 format and includes the far riverbank and trees in its composition. Cropping removes the redundant riverbank and favors both the softly flowing water and the lithe foreground branches, as well as a aesthetic pairing with Reflection and Flow #1. My personal definition of a panorama is 1:2 or greater. 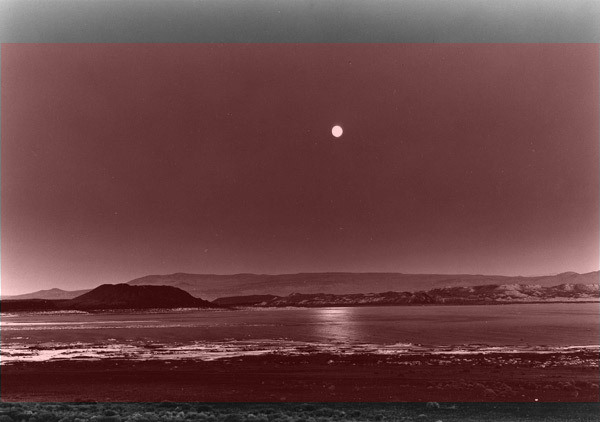 If the legitimacy of cropping in camera still eludes, I make mention of the fact that many large format view camera makers offer supplemental masks and 120 roll film devices to produce specific panoramic formats. What to do with the limitations of a large format camera and restrictive depth of field? For that matter, what to do with limited previsualization. Try to get above the subject high enough without blocking the light filtering into the deeper reaches of the furrowed leaf mass. Beautiful, yet not terribly meaningful. To paraphrase Ansel, nothing worse than a sharp photo of fuzzy concept. Once in the lab, no longer tempted by the inclination to wander on down the trail of never return, and finally loosed from the bounds of prescribed formats, all things are possible yet again. 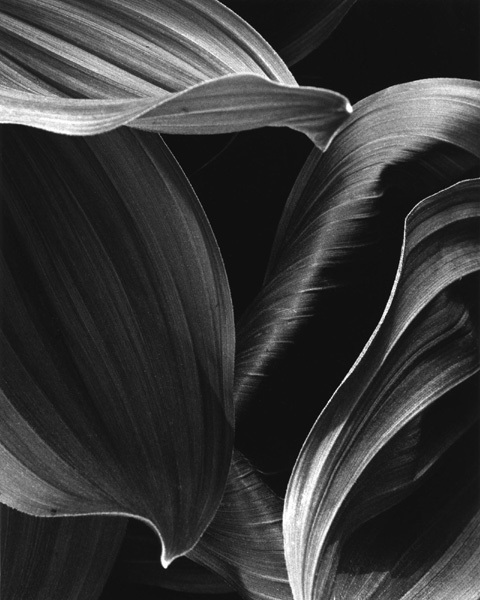 Ultimately, I now routinely work in 3 print formats (4:5, 3:5, 1:2), landscape or portrait orientation, cropped under the enlarger as determined by artistic bent, rather than by custom or camera designer. See Print Presentation to read how I deal with these together on a wall. Cameras are in the end only a tool for achieving your vision, not limiting it.